1976 was one of those years when NASA was looking forward and they put forth their ideas on the future of space travel and space colonies. Some of their predictions, a world population 10Billion, have not yet come to pass and perhaps that is why we are not all running around in space just yet. That and the abject absence of the spare finances for what would surely be a multi-trillion $ project. But its an interesting look back on what NASA thought the future would hold for us.......now we are here we know it to be different. But 40 years ago they dreamed the dream and Golden Lion - Blue Space Holidays and their Mars Safari offering was a possibility of course. They'll be space riggers, weightless welders and moon base quarrymen, closed-environment engineers, and so on. Space colonies won't be on the moon, nor on Mars or Jupiter. Space colonies really will be in space; enormous, man-made revolving doughnuts, built from materials quarried from the moon, and from huge lumps of material - nickel, for instance - towed in from the Asteroid Belt, where vast quantities of raw materials are conveniently parked, awaiting a user. But first, before I describe what it will be like living in these man-made paradises, I’d better try to convince you, in your turn, how and why it will happen. Basically, of course, it's another aspect of the energy crisis. NASA thinking is that, by the year 2,000, the earth's population will have risen to perhaps ten thousand million, compared with the present four thousand million. To maintain the high standard of living that so much of the world's population enjoys now would mean increasing our present productivity 40 times - impossible. But out there in supplies of energy can be harvested from the sun; the moon - and those asteroids - contain vast quantities of raw materials and, surprisingly, even of oxygen, trapped in the rocks. Walking into the sedate, bureaucratic Washington headquarters of the National Aeronautics and Space Administration, and finding US Government officials I’ve known for years during the Apollo moon landings sitting there solemnly working out detailed plans for space colonies, just like architects designing a new building, was hard to swallow. After three hours l came away convinced. In 30 years from now the first Space Colony - call it a large space station if that is easier to believe - will either be inhabited, or in an advanced stage of construction. And long before that there will once more be limitless opportunities for those pioneering spirits who did so well in Drake's time, and now find themselves imprisoned on Spaceship Earth. My friends at NASA don't expect to build the space colonies themselves. What they are doing is providing the techniques and know-how; just as they did nearly 20 years ago with TV satellites, enabling the whole world to watch live coverage of a football match or boxing contest, no matter where it was. Having done that, they handed the techniques over to commercial organisations which now make a handsome profit out of them. 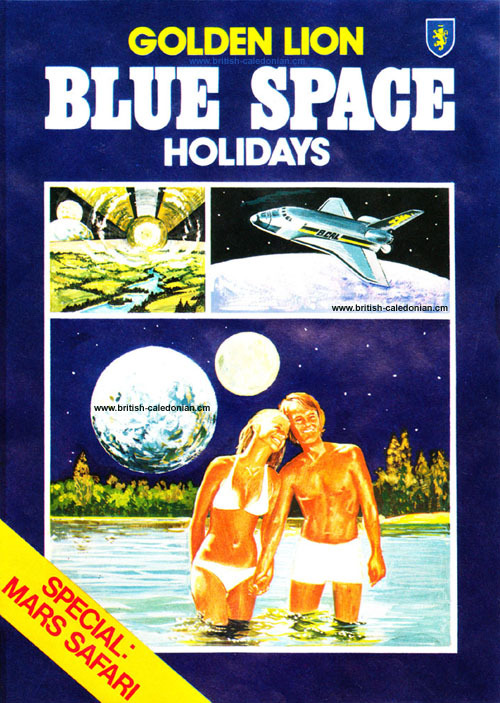 In the same way, space colonies must make a profit, not just by running the perfect holiday package, nor by operating weightless hospitals, which provide perfect recovery conditions after a heart attack. They must justify themselves by producing more than they consume; by sending back to earth supplies of heat and Power as the oil runs out; and all sorts of components and equipment made of new types of strong, lightweight alloys which can be made only in weightless factories. The new NASA philosophy begins inevitably with the new Space Shuttle, half-plane half-spacecraft, which will start its flight tests next year. Already 785 flights have been worked out between 1980 and 1994 - flights which will take nearly 5,000 men and women on space journeys. It is also based on the feeling that, quite apart from man's growing energy shortage, it is NASA's job to offer adventurous young people some exciting prospects for the future. The gloom and was-it-really-worth-it attitude which followed the successful moon landing programme has been replaced, I was told, by the feeling that “it's time to put back the dream into youth's vision of his future”. The timetable for that dream starts with a permanent space station being assembled and steadily enlarged in the late 1980s. From that men will be ferried to and from the moon, where a self-sufficient base will be established by 1998, providing its own oxygen, quarrying its own materials, growing its own food in half-buried houses and factories. Most of the prospecting for raw materials, and the quarrying once they are located, will be done by remotely-controlled equipment. With the moon's one-sixth gravity making launches much easier, materials will be despatched to the vicinity of the space station, where riggers, welders and technicians will be stationed to receive them. The heavy industrial equipment needed to do the assembly work will have been sent up to them by Big Dumb Booster, able to deliver loads of 250 tons from earth - five times as much as the Saturn 5 rocket. An early space colony, housing a mere 10,000 people, designed jointly by NASA and Stanford University, is shaped like a wheel, a mile across, revolving once a minute, so that those inside will have a '1G environment' that is, feel exactly as if they are on earth when they walk about. The tube in which they live will be 600ft high, about the height of London's Post Office tower. They will be able to see along it for half a mile, and a huge, ring-shaped mirror hovering above the colony will reflect cheerful, warm sunlight into the interior, both to provide pleasant living conditions and for growing food. The Russians have already done a great deal of work on developing 'closed ecologies', in which air, water and sewage are all continuously recycled for re-use. The colony's Spaceport, at the hub of the wheel, will be a busy place. With ferries plying continuously between the earth, moon and nearby zero-G factories busily processing aluminium and titanium which are abundant in lunar soil, as well as extracting oxygen from it. A bigger colony, in a cylinder 19 miles long and 4 miles wide, could support a population of hundreds of thousands. It would have towns and countryside, lakes and rivers. Clouds would form naturally; birds, insects and butterflies would be introduced a nice - balance of the useful and exotic. The NASA picture shows a suspension bridge as big as San Francisco’s famous Golden Gate spanning a lake. No doubt it would be possible to create tides, but there would certainly be no unexpected storms to interfere with the idyllic cycle of rewarding work and sunbathing leisure. Colonies for ten million people seem beyond belief until you work out how many cities of that size would be needed on earth to accommodate a population of 10,000 millions.